Good news for wine lovers! 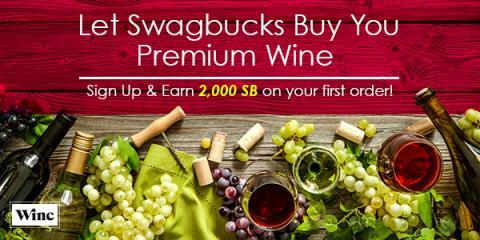 You can get paid to build up your collection through this special offer from Winc and Swagbucks. Winc is a great site that matches wines to your palate. Don't like a bottle they send you? No problem - they have a 100% satisfaction guarantee. You can get new wines delivered to your door every month, or skip a month if you feel like it. Plus, if you order 4 or more bottles, shipping is free! On top of all that, Swagbucks wants to give you up to $40 for checking them out (paid out in the form of SB points)! Sign-up and earn 2,000 SB on your first order. Stay subscribed for a second wine shipment and earn an additional 2,000 SB. Please click here for complete details and to get started! If you haven't tried Swagbucks yet, this is a great time to start! Signing up through me and then completing the first half of this offer and getting the 2000 SB entitles you to a bonus 300 SB. If you complete a survey through Swagbucks before November 1st, that's another 100 SB bonus. That means you can get a total of $44 worth of SB for trying out Winc, then turn those SB into gift cards to places like Amazon, Starbucks, Walmart, and Target, or get PayPal cash!